Railway Service Captain Recruitment 2018:- Latest News 6.03.2018 The Indian Railways Online Application soon inviting you to recruit Service Captain in 12,000 trains who carry over 23 million passengers daily which connects more than 7,000 stations. 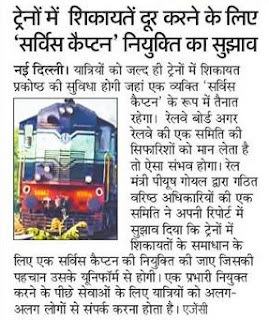 Introducing this service department as (CAPTAIN) constantly bringing in innovations to bring quality travel of passengers. Service Captain Jobs in Railway:- The suggestion of Recruitment ‘service captain’, identifiable by Rules. In Current period in Indian trains people facing problems of not getting so much help to travel. So Cabinet approval was made by a committee of railway minister Piyush Goyal – after meeting with all zonal heads. Name of the Post: Service Captain. Railway Service Captain Work:- The duties of the service captain would include supervising of cleaning, coordinating with different departments (कोई दिक्कत ) regarding complaints of linen, repairs and operational issues in sitting Arrangement, supervise coach maintenance issues such as (सामान चोरी या गुम होने, बर्थ, विंडो, दरवाजों को लेकर परेशानी) missing passenger amenity items, issues of berths , windows, doors and (ट्रेन में सफाई का निरीक्षक) pest and rodent control issues. Education Qualification:- Service captains should be appointed for a minimum of two years from among serving employees.However Thousands posts will be added of the level of a junior engineer or master craftsman by a committee of senior officials. Age Limit:– 18 to 40 years As Per Government Of India Rules. Pay scale- Rs.15600-39100/- with Grade pay Rs.6600.